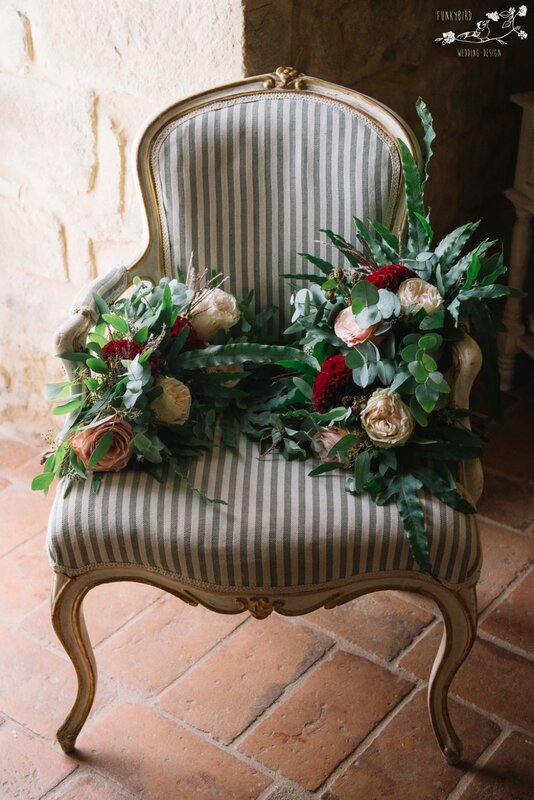 After a lifetime of friendship this beautiful couple decided to tie the knot in Maremma Tuscany on the beautiful wine estate of Conti di San Bonifacio. Maddy and Sam had been friends sinds middle school and their love is as beautiful as they are. There was such warmth and heartfelt kindness between both families and it was absolutely wonderful to see them come together. Weather wise it must have been one of the oddest days of the year. All day long it was incredibly hot and I was amazed to see that the flowers didn't entirely bailed on me :) The usually delicate and fragile peonies proved to be the strongest flowers ever and were in even better conditions than the roses. Only moments before the ceremony a storm decided to pass right in front of us. As in: a curtain of black rain literally slided across the sky for approximately 20 minutes, but luckily it kept it's safe distance and then just disappeared, as if it had never just threatened to play tricks on te entire wedding. Maddy liked a lot of rose gold accents for the dinner table so the artisan Tuscan made candles with metallic finish were a perfect match. 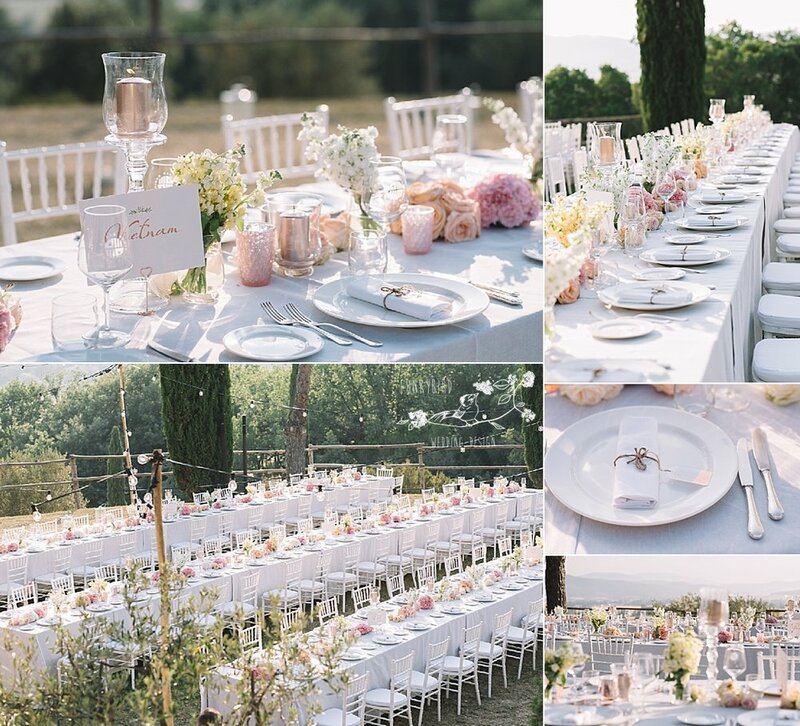 Lots of soft pinks, peaches and whites complimented the venue and olive green of the groves. 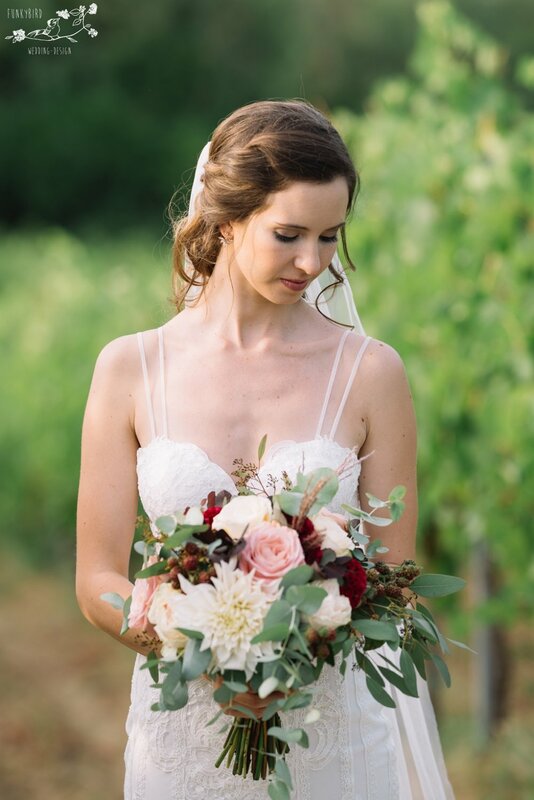 The entire team worked so hard to make sure all the details were perfect and Milos from FunkyBird Photography captured everything very elegantly. Angelo la Torre sent us a beautiful cinematographic trailer which you can enjoy here: https://vimeo.com/229255745 A special thank you to Bryony from Entourage for organising everything and inviting us into her team. From the bride and groom: Sonja, apologies for taking me so long to write you to say THANK YOU!! The wedding was a dream [...] and I loved everything. We received so many compliments, it was such a lovely room and decor. Thank you for your patience with us and for the amazing work. Please pass on your thanks to your team.